"It conforms to what we want - one of the most modern stadiums in the world: pitch, roof, multi-functional, with exceptional comfort levels for spectators." As sound bites go, FFR president Pierre Camou's words at last Friday's announcement were straightforward and succinct. Simply put, French rugby will have a new national home, the first one owned by the union. More importantly however, it will give the game's Gallic powerbrokers their best chance yet of preventing the growing income divide between the FFR and RFU from becoming a gaping chasm. Hamstrung by an uneconomic deal which has seen them hand over large amounts of cash to the consortium that owns the Stade de France over the last 15 years, Camou believes that now is the time to strike out on their own and build a €600m (£482m) 82,000 capacity stadium. Yet it seems the days of building stadia in the middle of nowhere haven't yet reached their conclusion if the FFR's plans to go by. French rugby's new home will be constructed on a former horseracing track at Evry, some 25 kilometres south of the capital. The smart money had been on a similar facility at Thiais-Orly, close to Orly international airport and only 15 minutes from central Paris by RER, but alas it wasn't to be. Money talks and its likely a new stadium would have cost a whole lot more than €600m if it had been located closer to the city. It's also perhaps interesting to note that the Mayor of Evry is one Manuel Valls, France's Interior Minister and one of French president Francois Hollande's lieutenants during his election campaign. Politically motivated? You might think that but I couldn't possibly comment! Speaking last Friday, Pierre Camou waxed lyrical about the project and Les Bleus' need for a permanent home. 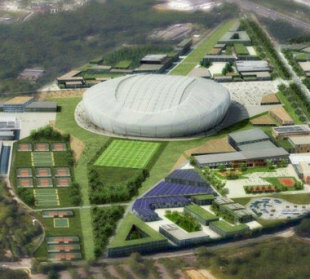 Camou said: "The choice of Evry-Centre Essonne / Ris-Orangis represents an important step in our plan to build a new stadium that belongs to the FFR, which is part of a long-term vision of the Federation. It responds to real needs that were identified several years ago. Today, the FFR must be independent in order to organise the great games of its national teams in France, and to support, in sporting and economic terms, the great enthusiasm that exists around our sport. French rugby must adopt 'his garden' just like the other great nations of world rugby." On paper at least, Camou's 'garden' sounds like a step in the right direction. The stadium, which will be located on the former Ris-Orangis hippodrome, will feature a retractable roof and removable pitch. As the centre-piece of a giant 133 hectare sporting, shopping and leisure complex, the FFR anticipate it will be able to stage at least 20 events a year, including concerts. So whatever the merits of locating a stadium so far from the central Paris, at least the Evry facility looks set to be an improvement compared to the soulless and cultural desert that is St. Denis. To label the reason for this move as anything other than financial however would be naïve in the extreme. "For a team that tends to sell out most of its clashes at the 80,000 Stade de France, that has amounted to millions in lost revenue every match." Since he came to power as president of the FFR in 2007, Camou has made the stadium issue one of his main priorities. The deal with the Stade de France has been a disaster for the FFR financially over the years, forcing France's powerbrokers to look across the English channel at the RFU's Twickenham cash cow with ever increasing envy. Figures vary depending on sources but it is thought the FFR pay close to €3m per game to rent Stade de France. To boot, the primacy of tenure enjoyed by France's association football side has seen the FFR move a number of autumn Test matches to stadia such as the 35,000 capacity Stadium de Toulouse because of fixture clashes. For a team that tends to sell out most of its clashes at the 80,000 Stade de France, that has amounted to millions in lost revenue every match. The figures look even worse when you compare them to the RFU's situation. According to its most recent accounts, the FFR turned over around €85m during the 2010-11 season. Just €10m of that money came as a result of profits earned from hosting six home games - two of which had to be played in Montpellier and Nantes. Compare those figures to the RFU's, who look set to turn over €160m (£130m) this season and who, thanks to the recent expansion at HQ can budget to make €10m (£8m) per match before costs are taken away. Despite the trials and tribulations of the XV de France over the last few years, rugby has never been more popular there. This latest move by Camou confirms that he will go to any lengths (approximately 25 kilometres) to keep the national union from slipping behind their internal (the French clubs) and external foes.